$200 cash back by spending $500 in net purchases (purchases minus returns/credits) during the first 90 days - additional terms may apply. Those looking for a quick, but sustained way to boost their cash back rewards should take note of the TD Cash Visa® Credit Card. This card offers 3% cash back on dining expenses, from restaurants to coffee shops, along with 2% at grocery stores, and 1% cash back other purchases. Cardholders who spent $500 in net purchases during their first 90 days as a TD Cash Visa® Credit Card member will receive a $200 cash back bonus. These cash back rewards never expire and there’s no limit imposed on how much a cardholder can earn. This makes it easy to save up points to be used on various things like airfare, car rentals, hotel stays, theme park tickets, watercraft rentals, restaurant bills, theatre tickets, gas purchases, travel health insurance, brand-name products/gift cards, or they can be put directly into your TD bank account. The APR for purchases with the TTD Cash Visa® Credit Card will be 18.24%, 20.24% or 25.24% Variable depending on your creditworthiness, and there is no annual fee with the card. Balance transfers will receive an APR right off the bat of 15.24%, 20.24% or 25.24% Variable. While there is no annual fee attached to the TD Cash Visa® Credit Card, there’s also no introductory APR on purchases. Instead cardholders’ will receive one of three rates -- 15.24%, 20.24% or 25.24% Variable-- based on their creditworthiness. There is, however, a 0% introductory APR for 12 billing cycles on balance transfers with the TD Cash Visa® Credit Card, making it an ideal choice for those looking to transfer debt from another card over to this one. No annual fee - There’s no annual fee associated with the TD Cash Visa® Credit Card. Get some cash back - The TD Cash Visa® Credit Card offers 3% cash back on purchases at restaurants, 2% at grocery stores and 1% cash back on everything else. Smart Tip: Points never expire and there’s no limit to the amount you can accrue, so cardholders can save them up for when they really need them. Once cardholders hit the $25 mark, those rewards can be redeemed. An extra $200 cash back – Earn $200 cash back for spending $500 in net purchases during your first 90 days with the card. The cash back from this offer will be reflected in your statement roughly six to eight weeks after the $500 in net purchases have been made during that three-month time period. Redeeming your points - Cash back rewards can be used on gift cards, travel expenses, brand-name merchandise or simply as a direct cash back. Cash back, literally - TD points are able to be redeemed right to your TD bank account directly. Travel benefits - TD points can be redeemed for basically any level of a vacation, including airfare, car rentals, hotel stays, theme park tickets, watercraft rentals, restaurant bills, theatre tickets and gas purchases. Brand-name products - At TDRewards.com, TD cardholders can use their earned points to shop for products online with brands like Apple and Fossil. There’s also a specific catalogue that cardholders can visit to buy products directly with points. On top of that, TD points can be used to get gift cards for brand-names like Best Buy and Starbucks. APR on purchases - The TD Cash Card features either a 15.24%, 20.24% or 25.24% Variable APR depending on your creditworthiness. 0% intro APR on balance transfers - For cardholders’ first 12 billing cycles with the TD Cash Card, they’ll receive a 0% introductory APR rate on balance transfers. After that, the rate will be either 15.24%, 20.24% or 25.24% Variable, depending on creditworthiness. No foreign transaction fee - Cardholders don’t have to pay any additional fees for using the card on international purchases. Free VantageScore® credit score - The TD Cash Visa® Credit Card offers free credit scoring from VantageScore®, along with other free credit education tools from TD CreditViewSM to help cardholders hold a healthy financial lifestyle. To access your score, you must enroll in TD Bank personal online services and accept the online banking service agreement. Your personal information on your TD account and credit file must match. TD Visa® Signature Benefits - If you receive at least a $5,000 credit limit on your TD Cash Visa® Credit Card, you’ll be eligible to be a member of the TD Visa® Signature Benefits program. Visa® Signature Luxury Hotel Collection - Cardholders can choose from daily discounts and special deals on specifically chosen hotels in certain destinations worldwide. This also extends to car rentals, special dining experiences and various shopping and entertainment events. 24/7 concierge service - Visa’s Signature® Concierge service helps cardholders book tickets to various events and other things that might be needed while on vacation. Protections for the road - Visa® also offers roadside dispatch, travel and emergency assistance services and an auto rental collision damage waiver, giving cardholders an added peace of mind while on vacation. Roadside dispatch - A 24/7, pay-per-use roadside service that will help cardholders with tows, tire changes and fuel delivery. Travel and emergency assistance - Visa® will aid cardholders with finding local emergency services when they need it on the road. Auto rental collision damage waiver - Cardholders will be covered if their rental vehicle is either damaged or stolen under their care. Visa® will also act as the middleman between the cardholder and the rental company. For this protection to apply, the entire rental purchase has to have been made with the TD Cash Visa® Credit Card. Protected by Visa® Zero Liability - This coverage from Visa® includes constant scans looking for unusual and possibly malicious activity on your TD Cash Visa® Credit Card. You’ll never be held accountable for unauthorized charges on your TD Cash Visa® Credit Card and there’s a 24/7 immediate assistance line at 1-800-847-2911 to aid Visa® customers whenever they need it. Those who frequently dine out will benefit the most from the TD Cash Visa® Credit Card. The TD Cash Visa® Credit Card will give you 3% on those purchases, whether you’re spending at your favorite Italian place down the street or stopping for a quick coffee at Starbucks. But even if you’re only the occasional restaurant-goer, this card offers 2% on grocery store purchases, and 1% cash back on all other purchases. Prospective cardholders who may be looking to travel relatively often will find some benefit to being a TD Cash Visa® Credit Card member as well. Roadside dispatch, travel and emergency assistance and an auto rental collision damage waiver are all added benefits of this card, as well no foreign transaction fee. Additionally, TD offers a 0% introductory APR for 12 billing cycles for those looking to transfer debt from one card to this one. Cash back percentages earned with the TD Cash Visa® Credit Card are 3% cash back on all dining purchases, 2% at grocery stores, as well as 1% cash back on everything else. TD is also allows new members who spend $500 during their first 90 days with the TD Cash Visa® Credit Card to earn a bonus $150 cash back. The rewards earned during this campaign will post to cardholders’ rewards accounts roughly six to eight weeks after that 90-day timeframe has passed. There’s no annual fee with the TD Cash Visa® Credit Card, and your APR will be decided based on your creditworthiness at a rate of 15.24%, 20.24% or 25.24% Variable. However, there is a 0% introductory APR on balance transfers during the first 12 billing cycles as a cardholder, making the TD Cash Visa® Credit Card an ideal option for those looking to move around credit card debt. To check where your rewards stand with the TD Cash Visa® Credit Card, cardholders can log onto TDCardServices.com, or call a TD representative directly by dialing 1-888-561-8861. Depending on your credit level, the credit line with this card could be as low as $500. This makes it easier for those with lower credit scores to get approved, but it could severely limit how much spending power the cardholder would have for things like travel. The 3% cash back rate on dining purchases and 2% on groceries is solid, but for those who may be looking for cash back options on purchases of gas, groceries and other common daily buys, the TD Cash Card may be a little less inclusive for you. All dining-related purchases earn 3% cash back with the TD Cash Visa® Credit Card. All other transactions earn 1% cash back. TD is also currently running an offer in which cardholders who spend at least $500 in net purchases during their first 90 days with the TD Cash Visa® Credit Card receive $150 cash back to their account. Cash back earned with the TD Cash Visa® Credit Card doesn’t expire and there’s no maximum amount a cardholder can earn, making it simple and easy to save your rewards for when you want to use them. The TD Cash Visa® Credit Card features a 0% introductory APR for a cardholder’s first year as a member, making it an ideal choice for those looking to make a quick balance transfer. After the initial 12 billing cycles, the cardholder’s APR on BTs will raise to either 15.24%, 20.24% or 25.24% Variable. 18.24%, 20.24% or 25.24% Variable, based on your creditworthiness. This APR will vary with the U.S. Prime Rate. 27.49% Variable APR -- This APR will vary with the U.S. Prime Rate. The TD Cash Visa® Credit Card is simple in what it offers cardholders as far as cash back rewards go -- 3% on dining purchases, 2% on grocery purchases, and 1% on everything else, with no rotating categories. But while some other similar cards on the market definitely present a little more leg work to earn your rewards, what you could reap from that labor may be a little more significant than what the TD Cash Card has to offer. The Chase Freedom® card is one such high-value cash back card, offering 5% cash back up to $1,500 in combined purchases quarterly on shifting categories including gas, groceries and at department stores, wholesale stores and drugstores, along with 1% on all other purchases. These sets change every three months, and Chase requires an activation of your 5% cash back rewards every quarter by a specific deadline -- a bit of a hoop to jump through to make sure you actually keep accumulating cash back. Chase also offers a 0% introductory APR on purchases and balance transfers for the first 15 months as a cardholder. The APR range following that is higher than the TD Cash Visa® Credit Card, running from 17.24% to 25.99% variable, and it similarly does not have an annual fee attached to it. Between the 0% intro APR for the first 15 months and the significantly higher cash back rates, the Chase Freedom® card may come out the winner for some prospective cardholders. 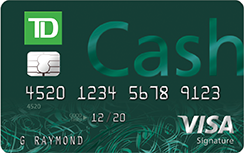 The TD Cash Visa® Credit Card is a nice introduction for those looking to get their foot in the door with a solid cash back card with no annual fee. The simplicity of the categories eligible for cash back rewards with this card also gives cardholders less to worry about in making sure they’re maximizing their earning potential. The ability to earn an extra $200 cash back by spending at least $500 in net purchases during your first 90 days as a TD Cash Card holder is a very generous offer, being that many other cards usually require somewhere around $1,000 in net purchases during that same timespan. Additionally 0% intro APR on balance transfers for the first 12 billing cycles make this an attractive option for those looking to transfer existing credit card debt.